Before you read this post, please be aware that my wife and I did not enjoy our first year of Ryland Home ownership. See "My Last Ryland Homes Blog Post & My Attempt To Help Ryland Homes!" to get a better overview of our Ryland Home complaint to the BBB, and links to the over 100 Ryland Home problems that were all eventually fixed after 13 months of having much of our time wasted. Since this topic can relate to most medium to large corporations, in my opinion, I am not singling out Ryland Homes or limiting this post's topic to the new home building industry. 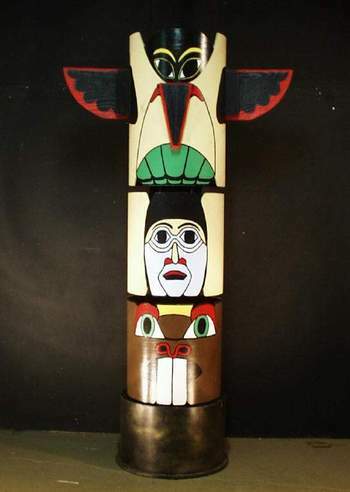 The totem pole depicted above shows the image at the top having wings. You could analogize this to the corporate "golden parachute" concept in that it is too easy for the people at the top of the corporate totem pole to blame the people at the bottom. Why? Because, many times the people at the bottom who deal directly with the customers don't have the power or authority to make improvement changes, but they do appear to have the most responsibility to make customers happy. In the new home building industry, I believe that the most important people to the consumer are the sub-contractors and "sub's" of the sub-contractors who actually work on your house. If any builder is in a cost cutting mode determined by say a Chief Financial Office at the top, then it may be hard for the person dealing directly with the customer to get that CFO, or managers underneath the CFO, to give the OK to even look for a better sub-contractor. Why? Because, some "customer irritating" sub-contractors provide the lowest cost to the builder. They do eventually fix the problems they cause for the new home owner ( See "My Ryland Homes Initial Repairs "Punch List"), but while the builder doesn't get charged for the fixing, the customer is inconvenienced, and his time is wasted, at the very time he's dealing with many other challenges related to his move! This was partially my point in "New Home Builders Deliver "Cleaner Upper" Homes". I did not mention in that post two Ryland Homes sub-contractors who did a poor job, at first, on my foyer wood floor, and my Silestone Kitchen counter tops. Requests for customer product and service satisfaction feedback are often sent out too soon. New home owners are very busy, and the best test is the "test of time". Opinions of customers can change over time, especially if the repairs are not long lasting. There is also the dilemma for the customer that if he says anything that even appears to be negative about the specific people that represent the builder, those comments will be the perfect excuse to blame those people at the bottom of the totem pole. Therefore, there should be the option of total anonymity in giving feedback, with plenty of space to comment on each line item of the feedback form. Now, in some cases it may be the fault of the employees of the builder who deal directly with the customer, but more often, in my opinion, it is the sub-contractors and their "sub's" that cause problems, complaints, and waste the time of the customer. Builders know very well that "time is money", so it would be a great opportunity for any builder to think a little more long term, invest a little more money upfront, and have the probability of more positive word of mouth advertising from their customers. I think the saddest thing is for customers to give good reviews and feedback on their buying experience (of any kind), when the whole truth is not as positive. But, just wanting to be "nice", fear of being misunderstood, fear of a possible "kill the messenger" mentality with some kind of retaliation by anyone involved in the selling process can cause the customer to not tell "the whole truth" as they see it. It is a shame, since sometimes the customer may just need to be educated about something, and some specific item negative misperceptions may be changed into positive, or at least, neutral ones.